LAS VEGAS — Floyd Mayweather Jr is scheduled to stand trial Wednesday before a judge on misdemeanor charges that the boxer threatened two homeowner association security guards in October 2010 in front of his home in a gated community outside Las Vegas. Mayweather has pleaded not guilty, and the trial could take most of the morning before Las Vegas Justice of the Peace Diana Sullivan. The judge could immediately decide guilt or innocence or wait to issue a ruling, prosecutor Roy Nelson said. Nelson and Mayweather lawyer Karen Winckler confirmed Tuesday that the trial was scheduled Wednesday. Mayweather could face up to a year in jail and $2,000 in fines if he is found guilty of both harassment charges against him. Homeowner association security guards Aaron Ryan and Miguel Burgos accuse the 5-foot-8 welterweight of threatening them after they ticketed several of Mayweather's vehicles parked near his house in violation of association rules, according to a Las Vegas police report. Ryan and Burgos didn't immediately press criminal charges. They later provided recorded interviews to police during which they said Mayweather berated them for touching his cars, told them he had pending gun charges, removed a ticket from one of his cars and put it on their security patrol vehicle, and told them, "my homies have guns, if you want me to call them they'd come over here and take care of you." Ryan told police he interpreted Mayweather's reference to friends with guns as a threat on his life. Mayweather declined to provide a statement to police about the encounter. 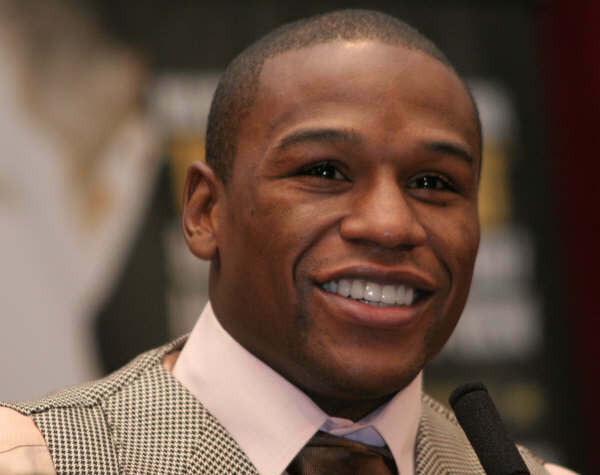 Authorities later said Mayweather does not have gun charges pending against him. The undefeated prizefighter is also scheduled to stand trial Nov. 4 on an unrelated misdemeanor battery complaint alleging he poked another homeowner association security guard in the face during a separate argument over parking tickets in November. He has pleaded not guilty. Mayweather also is to appear Dec. 21 at an evidence hearing on more serious felony charges stemming from a domestic dispute with his ex-girlfriend and two of their children in October 2010 at the woman's home. Mayweather could face 34 years in prison if convicted in that case. Mayweather is 42-0 in his professional boxing career, with 26 knockouts.